It all began in Nepal in 2009. I was a visiting professor at the teaching hospital in Kathmandu. Until then, all my experience had been in North American hospitals where my patients could expect modern intraoperative technology and extensive rehabilitation services. I could safely assume that they would have enough to eat, would take their medications and be supported after surgery. It was not the same in Nepal. Hospitals struggle to even have clean water and food. Laboratories provide only the most basic tests. Nepali doctors and nurses are very well trained, but they have only rudimentary and out of date equipment. Patients often travelled several days to reach Kathmandu, sometimes walking many miles. They brought their own food. They had to purchase the supplies for their surgery ahead of time. Families slept in the hospital to provide care and sustenance. The neurosurgery team saw many children with brain and spine birth deformities called neural tube defects. These devastating malformations occur in the first 4 weeks of fetal development before a mother even knows she is pregnant. The brain and spinal cord defects may leave the child with permanent paralysis and inability to control bowel or bladder function. We know what causes these birth defects and we know how to prevent them. They are caused by a lack of the vitamin folic acid during the first month of pregnancy. They can be prevented by taking folic acid supplements. What a tragedy to be born into a life of extreme disability, burdening the family with lifelong medical care, all for the lack of a vitamin costing less than 1 penny a day. Hence my new found interest in nutrition and disease prevention. If I was going to commit my time and effort to helping women in low resource settings at home and abroad, it seemed more appropriate to prevent disease than treat it, especially when prevention was cheap and effective. I delved into learning about how women in Nepal get their prenatal care, what they eat, where their food comes from, and how the Nepal Public Health System works. 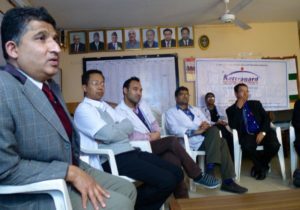 I spoke to Nepali women, Female Community Health Volunteers, nurses, physicians, public health workers, village leaders, government officials and international aid organizations. What I learned has changed forever how I approach my patients and medicine. Rural Nepali women do most of the agricultural labor. An astounding 70% of women in rural Nepal grow all of the food eaten by their families. They do not even buy cooking oil; it is meticulously ground from tiny mustard seeds and is prized for its flavor. The only commodity they purchase is salt. A rural Nepali woman’s day begins at dawn with a cup of milk tea. Household chores and field work will be done until 9am. Then she prepares a breakfast of white rice, lentil soup (dal-bhat) and boiled green vegetables for the family. If there is not enough food for everyone then the woman will go hungry. Sometimes there is only white rice and salt. The children leave for school and the woman goes back to doing chores. The second meal will be in the evening consisting of the same three items. Eggs and milk are used if available. Meat (mostly chicken and goat) is a luxury. Women are encouraged to attend a local health post when they become pregnant, but that may be a 3 hour walk away. At the end of the first trimester, they will receive folic acid and iron pills from the government, if available. Unfortunately, this is too late to prevent neural tube defects. Most young men have left the villages to work abroad, sending their earnings home. This leaves Nepali women in charge of agriculture and finances at home. Nevertheless, women are “required” to obtain permission for most decisions from either their husband, mother-in-law or father. In 2009 I formed Global Nutrition Empowerment (GNE), a non-profit organization dedicated to helping Nepali women improve their nutrition and prevent neural tube birth defects. We collected nutrition surveys, distributed vitamins and developed education material. By 2010, GNE had recruited Nepali partners. With the approval of the Nepal Ministry of Health GNE coordinated a study from September 2011 to October 2014 that was carried out by the Nepal partners, Health Resources Consultancy. For these 3 years over 20,000 women of childbearing age in 9 rural districts received a year’s supply of a daily prenatal vitamin pills and viewed a 20 minute nutrition education module taught by Nepali instructors. The program was enthusiastically accepted by women and local leaders. The Female Community Health volunteers, who are the backbone of Nepal public health system, all supported the program. GNE was ready to take the next step and asked the Nepal government for permission to import vitamins, but to no avail. Local leaders and women wrote letters and made requests, but the central government would not allow GNE to import vitamins. We were reduced to lobbying for change in Nepal policies – and then the earthquake happened. The earthquake on April 25,2015, was a terrible event for Nepal. Fortunately none of our colleagues were hurt in the earthquake, but everyone was affected. Our Nepal team said that if GNE was able to raise funds, that they would do the work to provide earthquake relief. We did. 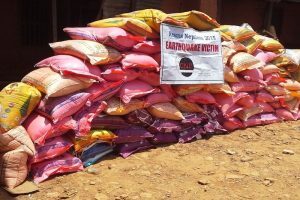 Initially they distributed food and tarps to badly damaged villages. Then they built 23 temporary school. Finally 2 permanent structures were built. One is a community development center in Sindupawlchuk. The other is a two room school in rural Myagdi district. Both are providing valuable services to their communities. All the earthquake relief monies have now been spent. An important part of GNE’s ongoing activities is the development of nutrition education material. GNE started by using traditional “flip charts” that require a teacher who is literate and knowledgeable. The next phase of education material used electronic tablets that had an interactive program. The current phase explores the use of smart phones. The phone application is intuitive and easy to operate. It has the advantage of being entirely audiovisual so that those with limited reading skills can still participate. Reinforcing questions and screen interactions allow for real time feedback. This platform was used on a trial basis in 2017 and is being upgraded. The current project will take us forward to 2018, when these interactive, engaging apps will be ready to trial in multiple languages and multiple sites such as the Philippines, Indonesia, Guatemala and the USA. 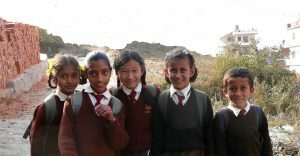 This then is our history, from perception of a tragic problem related to basic nutrition in rural Nepal to world-wide education and vitamin supplementation advocacy. GNE believes that all women of childbearing age in areas vulnerable to undernutrition can improve their health through nutrition. We want to help.